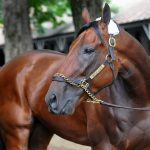 The Friday File: American Pharoah, the 2015 winner of the 141st running of the Kentucky Derby, the first Triple Crown winner since Affirmed in 1978, and one of only 12 such winners, is popular. The now six-year-old stallion has impregnated well over 100 mares at a fee last reported to be $200,000/session. As for tomorrow, I’m taking a chance with $10 to win and $10 to place on Mendelssohn.